The longest ever cycle ride that I have done was fantastic. From home-to-home I cycled about 133 Kms in 8 hrs 15 minutes of cycling time on Sunday 1st August including the climb up the hill which took me over 53 minutes. 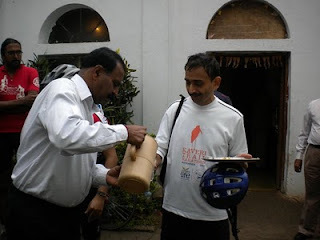 With over 120 cyclists on the road to Nandi ,fantastic support from Brigadier Vijay's army truck as well as folks from Tandem Trails, great encouragement from Yogesh and other cyclists from BBC and Vasu of BHUKMP for company it was a truly memorable experience! I plan to write more details of the experience in my next post hopefully before the end of next week. Meanwhile, take a look at this post with photos from GGI - another fantastic cycling group that I got introduced to on Sunday!. Check this for the hill climb timings of some truly amazing cyclists.